Once again, I’m going to give a rating from 0 to 5 for each card. 4: Strong staples. You want it in most decks of this faction and many decks of another faction. (Alternately, it might be a key engine for a particular Archetype). Ex: Corroder, Ice Wall, Professional Contacts. I will attempt to have my ratings represent the strength of a card in the CURRENT card pool. If a card will be significantly improved by some sort of effect printed in the future, I’ll try to note that. For example, Motivation from the previous set actually has a purpose now with Eureka, making it at least Niche, though probably not actually good. Of all the ways to shrink an ice, this one is probably the worst. I’d rather play Parasite and Datasucker. I’d rather play Ice Carver. Heck, if my goal was to ensure that I could shrink ice, I’d probably rather play Wyrm. However, with the existence of Scheharazade (I’m going to misspell it every time I write it in this post, in a different way each time! ), all 0 cost programs have a niche use: They can be installed on Sheherezade and eaten with Pawnshop, netting $4. Additionally, Pawn can bring this back, after the Pawn started on Sheherezade, potentially netting a card for Exile. If you play this card, it’s for this kind of tricks, along with the occasional actual use of the card to reduce ice strength. As a result of this, pretty much any 0 cost program that might potentially affect the game in some way is at least a 2/5, simply due to its potential use for this type of deck. 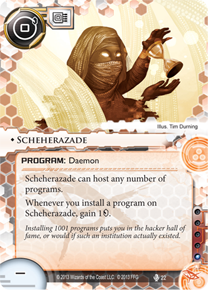 Schehererzade is an economy engine card for certain particular, program based runner decks. It goes right into current Noise builds and Professor decks, while also being viable in new strategies revolving around installing and consuming one-use program effects, or even pawning them for $3. Finally, any other program that it wouldn’t absolutely kill you to lose, can provide a free $ with this card. A Sneakdoor that you’re going to throw away once they ice up archives? $1 cheaper. Heck, if you have a good sentry breaker out and can be confident you won’t get your things trashed, you can even save $1 on each rig piece as well. I find Scheharezade to be the most promising runner card in the set, and an interesting direction for new runner decks in the future, even in Criminal decks, which as you see from the list above, have a number of ‘one-shot’ programs, as a criminal color-pie theme. Its not guaranteed to live up to its promise. Maybe the engine just isn’t quite good enough to compete with other options, but at the very least, we need to be giving it a serious try. This card is a ‘Bad Johnny’ detector. If you don’t know what I mean by that, Mark Rosewater, head designer of Magic: The Gathering, described ‘Johnny’ as a personality type of players who like to make combos, and ‘Bad Johnnies’ as people who like to try to make combos out of cards that everyone else thinks are bad. In the end, this is a much less versatile Forged Activation Orders. Its upside is to achieve something similar to Forged. Its downside is to do approximately nothing. At the same influence cost as Forged, there is pretty much no place for this card in anything. Useful as a surprise against those without diversified ice, you might be able to get a Sneak run into the end of one server, by breaking a cheap ice at the front of a different server. This can also be useful to get around certain ‘you cannot run this server’ effects. (Off the Grid, Ruhr Valley, Jinteki RP, Strongbox, and probably more to come). Probably not a 3-of, but it wouldn’t surprise me at all to see these popping up on occasion. It gives corps yet another reason to want to diversify ice. I am sad that this picture was wasted on such a terrible card, whose entire purpose seems to be to say, very forcefully, ‘Criminals are really bad at breaking Code Gates’ . The flavor text of ‘efficient as hell for certain very large values of efficient’ tells us that FFG fully understands this, and intentionally made a bad card in Leviathan. I don’t think there is anything wrong with intentional bad cards, as long as there aren’t a ton of them, and they result in discussion. (One With Nothing might seem like the worst Magic Card ever, but at least it generates a lot of discussion, which no 3 mana vanilla 2/2 would ever do. I mean, look how much longer my section on Leviathan is, than my section on some random, borderline playable card). It is on the point of ‘certain very large values of efficient’ that this card has raised a lot of discussion. Plenty of people’s reaction to this card has been: “Wow, what sort of scary Code Gate are they going to come out with that will make me want to play this card!” The short answer is “8 strength code gates with 3 subroutines”. But the real answer is that the whole concept of paying a ton of money to break some huge ice is strategically terrible. Choose Chaos Theory as Identity. (Apologies to any actually good Chaos Theory players out there. Like Bad Johnnies, we should call this type of player a ‘Bad Chaos Theory’, as this is generally their preferred ID of choice). Don’t run at all until I have a Magnum Opus, Gordian Blade, Snowball, and a bad sentry breaker in play. (Alternately, run turn 1, get wrecked by your tracer ice, then have to click for $1 a bunch so I can play my Opus). Finally start running, and then pay enormous amounts of money to break every ice I encounter. I’m not actually sure which is the greater fallacy, the lack of any running until the rig is assembled, or the willingness to pay inordinate amounts of money to make routine, non-critical runs where you pay $8 to get through Tollbooth. This type of player then eventually learns ‘I need to run more aggressively’, which for this deck simply results in a few accesses, and then being even less prepared to deal with the corp’s agenda server when they try to score something. I think that by now, most of us have learned that the never running at all thing is a huge weakness. But not as many of us have understood that paying a lot of money to get through a big ice, as a deck strategy, is also a huge weakness. Andromeda with Datasuckers, Emergency Shutdown, and Account Siphon. This deck deals with big ice by shrinking them to a reasonable size so that efficient breakers like Yog can break them cheaply, derezzing them with Shutdown, and Siphoning you so that you have trouble affording them. The deck also gets going fast with the 9 card start, to try and hit you hard before you can get big ice up. The plan rarely involves paying lots of money to break big ice. Gabe with all the Criminal tricks. 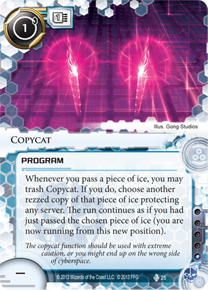 Similar to Andromeda, this deck will hit you with a combination of denial, derezzing, ice avoidance (Sneakdoor, Inside Job, and Femme to get around things), and possibly even Datasuckers and/or Parasites as well. The plan is to pressure you so hard that you can’t ever stabilize with big, rezzed ice. The plan is NOT to pay lots of money breaking big ice. Kate (or any other shaper) with Atman, Datasucker, and Parasite recursion. 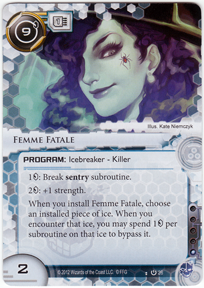 This deck deals with big ice by tutoring up a big Atman or a Femme, and then going through it for just $1 per subroutine. Parasite recursion can also kill problematic ice, or simply clear out the chaff that you don’t have the right breaker for. The plan is never to pay a lot of money to break a piece of ice. Noise with all the Viruses. This deck deals with big ice by killing it with Parasites, shrinking it into range of cheap fixed strength breakers with Datasucker, or breaking through it a small number of times per game with something like Crypsis, and possibly Stimhack to pay for it. Noise should be aggressive until you actually can manage to get a defense going, at which point he goes ‘fine, I’ll finish you off with milling and one last Glory run (after taking out your Jackson). The plan is NOT to pay a lot of money breaking big ice multiple times. Whizzard economy denial. This deck deals with big ice by making it hard for you to afford it, trashing your economy, and Vamping/Siphoning your credits before attacking the server that matters. And if you can get something big rezzed, through the Rook and Siphoning, there are probably Parasites. Once Reina Roja is printed, it will be represented in this archetype as well. All good runner decks have a better plan for dealing with a Tollbooth than ‘I have to pay $7 to break it with a Gordian Blade’. 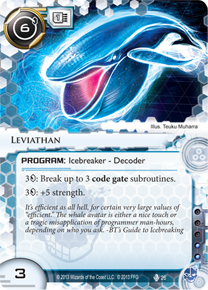 All good runner decks will have a better way of dealing with some future 8 strength 3 subroutine Code Gate, than breaking it with a Leviathan. Breaking a Tollbooth for $7 over and over should NEVER be the plan. Not when you are constructing your deck, at least. (It happens sometimes in-game when your good answer won’t show up, as a backup plan. But if your deck doesn’t have the good answer in there, that’s a flaw in the deck). So how about Criminals. Criminals are bad at Decoders right? Maybe you need a 0 influence solution. What if I told you there was a Criminal card that can efficiently handle a huge Code Gate. What if I told you this amazing card can simultaneously handle Sentries! What if it could handle other things as well. Only $3 more than Leviathan and you get a free Sentry breaker tacked on as well, instead of a Code Breaker than requires $3 to get through a simple Enigma. This is in addition to other criminal tricks like Sneakdoor+Shutdown. You can be a Bad Chaos Theory player without playing Chaos Theory, of course. You might make the mistake of splashing Gordian Blade in your criminal deck (or even Anarch), because ‘I need to be able to break Tollbooth’ (for $7). There are better ways to break Tollbooth! 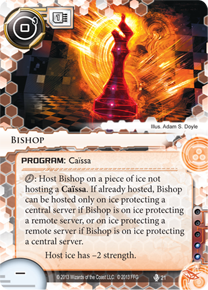 You might make the mistake of cutting Emergency Shutdown from your Criminal deck, neutering your ability to handle large ice efficiently. 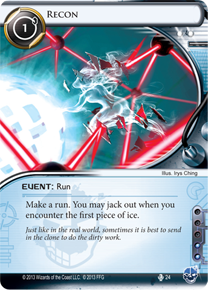 In short, when you make a deck, have a plan for big ice that isn’t breaking it for lots of credits. Breaking it for lots of credits will probably also be available as a backup plan (Crypsis is a good backup breaker in decks without things like Atman), but that’s the backup plan! The real plan gets you through that big ice somehow, semi-efficiently. More efficiently than Leviathan and its ‘very large value of efficient’. If you learn only one thing form this article, learn this one!! If an icebreakers ‘advantage’ is that it breaks some huge thing for $1 less, but its a lot less efficient against small ice, then that is BAD. You break the small ice a LOT more often than you break the big ones! Eureka: 2/5 but with MUCH higher future potential. Eureka is the first card to combo with motivation, but it’s still a pretty clunky combo. Having tried it a couple times, I find that it needs more pieces to be worthwhile. Specifically, it would be nice to have more deck-looking/stacking effects for it, and more targets. If there were more huge Hardware or Resources to get with it, that would help make the ‘waiting with Motivation’ plan stronger. Right now most of the big things you can get are programs, and you can already Test Run/Scavenge those (or Retrieval Run). As a combo with Test Run, it’s far less efficient than Scavenge. Give me an amazing 10 cost Resource, and I might want to Eureka/Motivation that into play. I expect this card to grow more powerful/more viable with time. 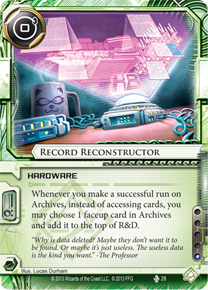 This card has some problems, and its value as a ‘stall tactic’ to make the corp waste time redrawing bad cards is pretty minimal. 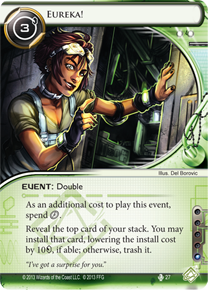 It best use might be as a Replicatable item to consume with Pawnshop, but that isn’t actually a very appealing economy option anymore, now that we have so many other good runner economy cards. They don’t stack with each other. You can’t load up 3 bad cards at once by having three of these, because each one just allows you to replace your normal access with ‘you may choose 1 face up card from Archives and add it to the top of R&D’. It doesn’t work on face-down cards, so you still have to hit that Shock or whatever that you don’t want to hit, at some point. Jackson Howard easily draws through the crap. There isn’t really that much crap in corp decks to begin with. And if you are really causing the corp pain by putting his Enigmas back on his deck that you made worthless with Yog, he can always install them into new remote servers. This would require some other, as yet unprinted effect to become playable. Another potential economy engine for runners, this one potentially being Replicatable, and providing discounts with Kate. The potential cheaper cost makes it possibly better than Underworld Contacts, and as a Hardware, it’s far less vulnerable. However you have to have events with a credit cost in order to actually get the money. 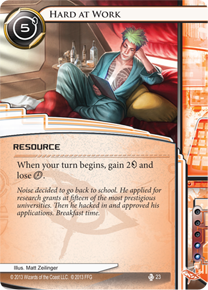 Still, there are plenty of cards to use this with as an economy engine: Sure Gamble, Dirty Laundry, Quality Time, and various utility cards like Escher, Makers Eye, Inside Job, Levy AR Lab, etc. The best thing about this economy engine is that its highly resilient to disruption. You aren’t harmed by program destruction, unlike Opus or Sheharezade. You aren’t harmed by tags, unlike Professional Contacts, Kati Jones, Underworld Contacts, etc. 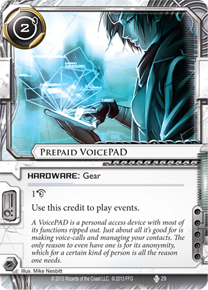 You can play VoicePad + economy events in the most tag-me deck imaginable, and run into any ice unafraid that it will trash your economy. (I guess you can go ahead and blow up my 2 cost Hardware with your Flare, but that’s it). It will be interesting to see if either VoicePAD or Schererezade (still easy to find new misspellings!) result in new runner economy engines becoming popular metagame choices.